The ones I have tried have been either tasteless, too full of sodium or cheese, or just blech! I happen to love REAL hamburgers so the bar is very high when it comes to this particular food. The concept, veggies and beans formed into a burger shape, is SUCH a good one. This way you have a portable, cooked, healthy snack that is easy to eat. It makes it easy to turn down all those burgers that you pass on your day (how many times did I drive by a burger yesterday?). Solution? Isa Chandra Moskowitz and her new cookbook, "Appetite for Reduction". This book rocks! It features VEGAN recipes that are low in fat and they are just awesome. Vegan, in case you don't know, means that ALL animal products are excluded from the recipes. I'm not just talking about meat, but also dairy and eggs are not eaten by vegans. They won't even touch the lowly anchovy! You would think that all vegan cookbooks would be low in fat and sugar, but they aren't. Vegans still use oils and sugar, and while their recipes may be healthier than most, they still can pack a bunch of calories. That is why "Appetite for Reduction" is so special. Isa paid attention to the calorie content of the food she created and her recipes are only 200-400 calories per serving. She includes all the nutrition facts for every recipe (but she left out the Weight Watchers Points, oh well). The veggie burger below is 130 calories, and, honestly, I liked it better than a hamburger. The only part I didn't like was all the time it took me to make it (probably about 45 minutes). Next time, I will double the recipe so that I can freeze some for later use. These were too spicy for my kids, but I absolutely love them for an afternoon snack or lunch. They can be eaten at room temperature. Isa has a great website - check her out at Post Punk Kitchen to learn about more vegan low-fat recipes. Please share your favorite veggie burger brand or recipe. First, we're going to saute some veggies. Preheat a large, heave-bottomed nonstick pan, preferably cast iron, over medium-hugh heat. Saute the onion for about 3 minutes. Add the zucchini, garlic, cilantro, and a pinch of salt, and saute for 7 to 10 minutes, until the zucchini is soft. Transfer the zucchini mixture to a food processor. Add all the other ingredients except for 1/2 cup bread crumbs. Did you hear me? Reserve 1/2 cup of the bread crumbs! Pulse until mostly smooth, but there should still be a little texture. Transfer to a large mixing bowl. Preheat the pan (the same one you already used to saute in is fine) over medium heat. Add the remaining 1/2 cup of bread crumbs to the burger mixture and use a fork to thoroughly combine. Divide the burger mixture into six equal pieces. An easy way to do this is divide it in half, then divide each half into three basically equal portions. You can do that right in the mixing bowl if it's large enough. Spray the pan with non stick cooking spray. Form the burger portions into patties and cook for about 12 minutes, flipping the burgers often, until they are nicely browned on both sides. Use cooking spray as necessary. Do three at a time for best results. They taste great served immediately but they're also excellent at room temperature, so don't be afraid to stuff one into a sandwich and take it for lunch. I've never found a veggie burger that I liked... if this is spicy than it might be pretty good. If you want a lean burger, just buy grass-feed beef. It's absolutely delicious! @Jennifer - thanks so much for sharing this! Awesome to see you try all these healthy recipes - wow! Trader Joe's Vegetable Masala veggie burgers are my favorite! and Earthfare's Almond Grain burgers are a close second. I enjoy Dr. Praeger's veggie burgers. They are chock full of veggies and pretty tasty. I'm shocked that you haven't heard of Dr. Praeger's veggie burgers!! I found them at Costco of all places. I got the california veggie burgers which if you read the ingredients - they are all "real" food items - and mainly veggies!! Check out the website - and check out the product, they are pretty good! I love Isa's cookbook! She has the tastiest oil-free dressings in it. It has fueled my shopping list since I bought it a few months ago! The recipe makes a ton and you can freeze them. I just fire up the Foreman grill and enjoy! Ditto for Dr. Praeger's veggie burgers... They taste great... I just don't like their prices.. a bit too steep! These sound great! Any suggestions on a replacement for the chipotles/adobo sauce? I'm wondering if omitting them would make the burgers too dry. I'd like to adjust the heat for my 5-year old. Of course, Mommy gets a batch WITH the chipotles! Personally, I love Gardenburger's Veggie Medley and Black Bean burgers... and I had thought they were pretty healthy... don't tell me they are loaded with sodium or something... I will have to go check the label. This recipe looks great! I found that my favorite Veggie Burger is the Morningstar Grillers California Turk'y! It is must more flavorful than a lot of the other veggie burgers. I also like the Trader Joe's and Dr. Praegers veggie burgers. The recipe looks good but too much work - I am a lazy vegeterian! When I do feel energetic I make my own black bean veggie burgers. They don't take long to make and I love black beans.I can put them on the grill or pan fry them. The recipe makes about 5 so I always have extra for later - maybe next time I will freeze some. @laxmom16: I like the homemade black bean veggie burger idea! I wonder if this recipe would work just as well w/ black beans v. lentils?! 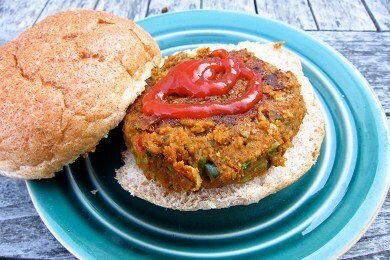 My favorite store bought veggie burgers are Sunshine burgers: http://www.sunshineburger.com/ they are one of the few that are gluten fre AND soy free! I love them! They taste amazing! You MUST try the new Gardein burgers? They are amazing and taste and smell like real meat burgers but are totally vegan. They are the favorite veggie burger by far in our house. Wow these sound delicious! I like the idea of adding cilantro. These are made out of black beans and they are so good. The best part is that there are no nasty additives that you get from the frozen store bought stuff. The BEST veggie burger I've ever had was a black bean and millet burger topped with red onion and a hint of both vegenaise and vegan barbecue sauce. Absolutely delicious!